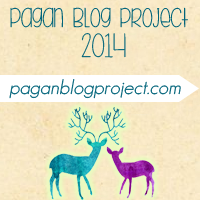 So, last week I was given an Inspiring Blogger award from This Pagan House. So Thank You so mu ch! This is really cool so … here’s how it works. Okay, I read blogs daily. I tried to narrow the playing field with some qualifiers. First, some blogs I read have a ton of press and readership and while they are awesome – they’re so well known I think this should go to someone more on my level. Second, I tried not to give repeat awards. Finally, I tried to keep it to blogs that appear to be active, so I am going to give two extra shout-outs to people who I’d love to give the award to I’m just not sure if they’re even blogging anymore. Shout Outs to: A Changing Altar and HippyJerseyDevil I respect your decisions not to blog and hope you are both doing well and this finds you. But your posts, while there were wonderful. Love! 7 Interesting Facts About me... interesting is subjective but here goes…. 1) I don’t really have a favorite color. My most preferred color for clothing is taupe, which makes me sound boring but hear me out on this one: the more neutral your staples are (shirts, trousers, etc) the more colorful your accessories can be. My “favorite” color varies depending on my mood and the circumstances. If you ask me what my favorite color is, I usually respond with “Rainbow” and I mean it: ROYGBIV always makes me happy. Really though this is only because I have learned people get really startled if you tell them you don’t have a favorite color. 2) I love Second Life: where I have two characters, one of which is a 10 year old girl named Gemma. I would really like to start a witchcraft training course on SL; it has the “in person” quality while being online. I really feel like I should teach some of the skills I have but in real life I feel like it’s bad form to say “I’m good at X let me teach a class on it!” Also, I barely know anyone in my local occult community anymore – like I said before, I stay away due to drama. 3) I am one of those crazy people who refer to my dogs as my children. 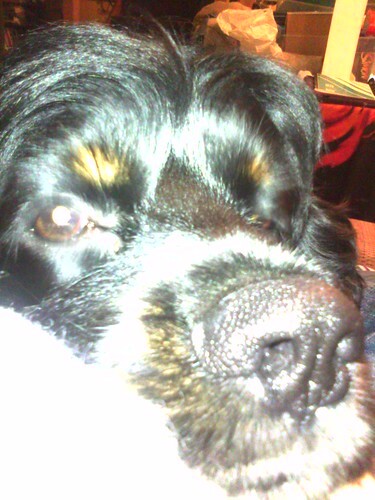 This is my baby: he’s a crazy cocker spaniel named Happy. Obviously, I love him fiercely. 4) Back in the day, I was super into hacking. Now, I don’t know how my Mac or smartphone works… and I don’t even care. 5) I’m a trained midwife; I just don’t practice. To have the proper certifications in MO, I would really need to have a BSN and a masters in nursing specializing in midwifery – but when I went to uni and saw the prestigious nursing program mapping out the next four years of my life in front me, I just couldn’t go through with it. I’m still searching for a way to meet my calling to protect and serve women’s healthcare and reproductive needs… without practicing midwifery illegally or committing to academic programs I know I won’t finish. 7) I’m a published poet – but I haven’t written anything good in years. I do still exist! I just haven’t had the motivation to write out the regular full posts I had been doing. I still am blogging though, on Tumblr (the link is on my blog), and after talking with my mother in-law I’ve decided to write some smaller posts that I can post to my WordPress blog too! I’m going to be doing my rounds again in the blogosphere, so I’ll be trying to comment and blog more often. Thanks so much for the shout-out! It’s very very flattering! I’ll be seeing you again soon!